There are no sheds as poplars have been cut down. Their leaves don't make melodious sound, in the wind. They don't sing. They are not grown along the river. It has been twelve years since I first saw them in this field. Now they are lying down on the ground and my seat is made by them. Black birds have gone away to make the nests where they find shed of hazel. They used to sing melodious songs. Now they can't be heard. The poet thinks that his days too are passing away and he should be lying down like those poplars. He should be lying down before there appear new poplars. Such scenes make him think deeply about perishable human enjoyments. How short is our enjoyment when our lives are so short. Man is the most perishable thing in the world and people will live shorter than now in the future. Ans: The poplars are cut down which used to grow along the Ouse river. The river doesn't reflect the shadows of the trees. Their leaves don't blow the air and sing a song. They were in my field and now they made my seat. Our lives too will be lying down like the trees. Our lives are perishable like the woods. Such events inspires the writer to think about the perishable nature of human joys. Ans: The poet has written this poem in defence of nature conservation because he says we get some important human aspects from the trees. 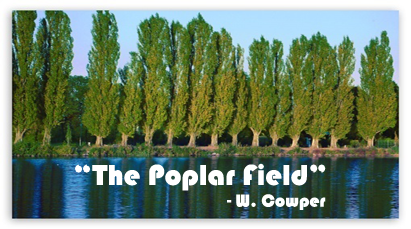 The poplars represent the jungle. When we preserve the trees we can get shades, pillars for our houses. The poet compares the tree with human life and says our lives are more perishable than the trees. We are destroyed by the nature so we should defend the nature. Ans: The poem deals with the personal feeling according to the principle of romanticism. The poem also belongs to romanticism. Romantic writers don't care the common interest so they express their personal emotions using singular pronoun 'I'. So, in this poem we see the first person instead of others. Personal approach makes the expression stranger and powerful. Ans: Living in the country is living with the nature. The country is full of natural elements such as, forest, steam, hills, grass, and lawn. People living in the country know the real love of nature. Birds are settled in the jungle and they chirp in the morning and evening which is the source of human life. We learn many things from the nature. Jungle animals and birds are happy friends of men. Their life-style and our life-style are similar. Our life is fruitful when we live with nature. We are related to the nature directly. We can get first hand materials from the jungle, country and the nature but in the city we don't have any touch with the nature. Ans: The poem compares the life cycle of poplar and the human life. Poplar grows up, it produces branches, leaves. It makes shades, pillars. It lies down, perishes in the ground. Our life also grow and perish. Human life is also similar to the natural life. However, the life of nature or trees passes through time. The human life is also the same so our enjoyment goes away from the life. 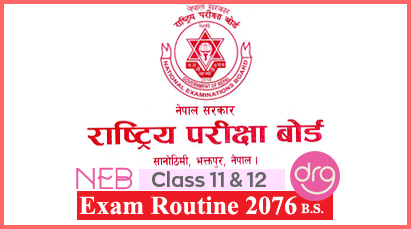 Summary Of "The Poplar Field"
Class 11 Course "The Poplar Field"
Translation In Nepali Of "The Poplar Field"
Word Meanings In Nepali Of "The Poplar Field"
Question Answers Of "The Poplar Field"
0 Response to "The Poplar Field | Summary | Question-Answers | Class 11"